A song to play while reading about the Tigers: “Rich Kid Blues” by the Raconteurs. Led by Detroit’s own Jack White, the band plays a song about his hometown Tigers under the ownership of Mike Ilitch’s son, Chris. The 2018 Detroit Tigers finished the season third in their division, which doesn’t sound all that bad until you remember they play in the American League Central and only won sixty-four games, the same number of wins they notched in 2017 when they were the worst team in the majors and received Casey Mize for their troubles. Unsurprisingly, neither fans nor projection systems held much hope for the 2019 iteration, and that was without knowing Michael Fulmer would be lost for the year to Tommy John surgery. Before that news broke, the machines saw Detroit again posting about sixty-four wins. You have to think those numbers will go down once the human managers of the machines remove Fulmer from the inputs for 2019. Things aren’t as grim as they are in Baltimore and Miami, but if you like to watch winning baseball, you might prefer to watch a different team this year. If you just like watching baseball, though, then the Detroit Tigers might be your team. We all know that baseball is changing; indeed, the baseball is changing. The three true outcomes define the game’s aesthetic like never before, teams are more reliant on home runs for scoring than they’ve ever been, and balls in play are vanishing. Like Buckley’s conservative, the 2018 Detroit Tigers stood athwart baseball’s historic march toward its ultimate extremity and shouted–or, perhaps, murmured– “Stop!” For those suffering from TTO fatigue, the Tigers were their antidote. While the 2018 All-Star Game was a near-ideal representation of baseball’s all-or-nothing age, with thirteen of the fourteen total runs scored coming by way of the long ball, Detroit, at that juncture, represented the polar opposite: no 2018 team to that point had scored a lower percentage of its runs with homers than the Tigers. Sure, they weren’t scoring a lot, but when they did, they found more creative ways to do so. That plus low strikeout and walk rates made Detroit a relative ball-in-play dream, which, these days, makes for an entertaining oddity worth watching. If that doesn’t do it for you, tune in for Daniel Norris‘ battle against the demons of endurance, Nicholas Castellanos‘ battle against the trade market, and Miguel Cabrera‘s battle against time. Also welcome: Pirates fans confused about where their middle infield went. 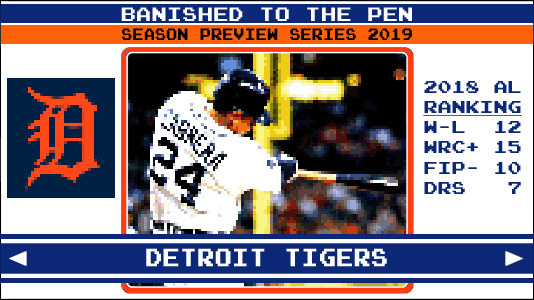 The Tigers played what’s now regarded as an old-fashioned style of baseball in 2018. That may, for the sake of current contrast alone, constitute an entertaining style of baseball, but it doesn’t tend to be a winning one. For that, Detroit is trying an old-fashioned rebuild, and the assembly line rarely is a pretty sight. All we can do is trust the engineering, design, and manufacturing teams and wait on the finished product. Tigers fans are willing to be patient, but they’re going to expect at least a prototype before too long. What is the Tigers’ most recent accomplishment? In 2014, the Tigers had finished a historic stretch for the franchise, winning a fourth-consecutive AL Central Division title. During Jim Leyland era, the Tigers went to the playoffs 4 times in 8 years including World Series appearances in 2006 and 2012. They probably should have gone to the World Series in 2013 too, but were foiled thanks in large part to David Ortiz’s 8th inning grand slam in game 2 of the ALCS. The 2014 Tigers bolstered one of the best starting rotations in 20 years, with Cy Young winners Justin Verlander, Max Scherzer (the best pitcher of the past six years), Rick Porcello, and David Price. The #5 starter, Anibal Sanchez, led the American League in ERA in 2013. But that team would be swept out of the ALDS by the Baltimore Orioles, thanks to their traditional Achilles heel of a bullpen. How do the Tigers define success in 2019? The Tigers rebuilding plans are centered on several starting pitchers, two of whom will start the season with the High-A Lakeland Flying Tigers. The development of 3 or 4 of them into sure-fire MLB starters will be key to the success of the rebuild. Franklin Perez (rated as the #78 prospect by MLB.com) was the centerpiece of the 2017 Justin Verlander trade and has a 2/3 starter ceiling with a four solid pitches and traditionally excellent control. But 2018 was a lost year for Perez, who started and ended the season on the injured list, sprinkling 7 ineffectual starts in the Gulf Coast and Florida State Leagues in the middle. Joining Perez in the Flying Tigers rotation is the #1 overall pick from 2018, RHP Casey Mize. Mize is a consensus top 50 prospect going into 2019 (#19 by Baseball America). If things go well, both Mize and Perez will join the more-polished Matt Manning in what could be a star-studded Erie Seawolves (AA) rotation. Manning (#50 Baseball America), the Tigers’ top pick in 2016 (9th overall), played at three levels last year, starting the season with single-A West Michigan, stopping at high-A Lakeland before settling with Erie. He threw a career-high 117 innings with a pretty consistent 11 K/9 rate across all three levels. Manning has two plus pitches, a curveball and 93-97 mph fastball, and a serviceable changeup. Alex Faedo, the Tigers 1st round pick in 2017, will also probably start 2019 in Erie. In his first pro season, Faedo threw 121 innings at two levels, starting the year at high-A before finishing off the year with the Seawolves. Faedo suffered from a loss of velocity last year, so getting some of that back would probably vault him back into the top 100-ish prospect rankings. While Nicholas Castellanos may be the embodiment of the current free-agent market, the player who most embodies the Tigers’ current status might be Victor Reyes. A 2017 Rule 5 pick, Reyes had to stay on the twenty-five-man roster for all of 2018 or else be placed on outright waivers. Having little for which to contend in 2018, the Tigers indeed kept Reyes with the big club all year, and he looked exactly like a 6’5″, 194 lbs. twenty-three-year-old who still was growing into his body and never had played above double-A in his life. In case you’re wondering, Reyes still runs like a baby deer and belly-flops a few feet short of home plate instead of sliding, but he’ll start the season in Toledo, a place he should’ve and would’ve visited much sooner but for the Rule-5 restrictions. What do Al Avila and company see in Reyes, then? In brief, a project whose ripening date is more than a year or two away. Reyes’ big-league stats — witness his team-worst 63 DRC+ — aren’t pretty, but they aren’t supposed to be. He exists in a shrouded state of nearly pure potential energy, last year’s extended glimpse offering little vision of the future, though it did reflect some good instincts (e.g., below-average strikeout and whiff rates). Check back on Reyes and the Tigers in a couple years, and maybe just watch the Mud Hens in the meantime. While I know that co-author Mark will be in line early on June 28 for Lou Whitaker/Lance Parrish Mini Bat Night, and I could say something unkind about April 20th’s “Trapper Hat” day (“It’s a trap!”), when it comes to fan promotions, the day you don’t want to miss is the June 29 Sparky Anderson bobblehead giveaway honoring the legendary skipper, who helmed Detroit to its last world championship thirty-five years ago.